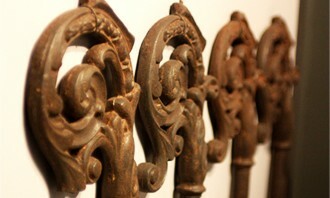 It is easy once you are here to navigate the region. The best ways to get around Gyumri’s historic town are by foot, taxi or public transportation. If you plan on visiting the surrounding countryside, regional rail and cars are your best bets. View map of the region. Many of the beautiful cultural gems are found within close proximity to the city center and are very accessible on foot, so make sure to wear a comfortable pair of walking shoes. There are three different railways. One is the South Caucasus Railway that runs Gyumri – Sanahin – Gyumri. The train runs daily departing from Gyumri at 7:10am, arriving in Sanahin at 9:48. On the way back this electric train will leave Sanahi at 15:10, arriving again to Gyumri station at 17:36. From Gyumri station you can also take another train to Yerevan (capital of Armenia). This train will depart from Gyumri station 8:35 and from Yeraskh at 7:10. 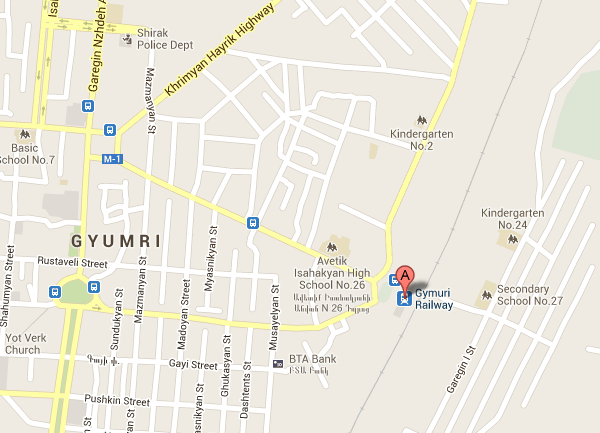 The Gyumri-Yerevan, Yerevan-Gyumri train service is the cheapest way to get in and out of the city. 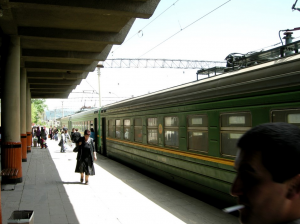 The Yerevan-Gyumri train runs every day at 8:00AM and 6:00PM and takes approximately 3 ½ hours. 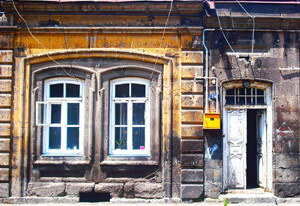 The train station is located in Kayaranamerts Square at the eastern end of Tigran Mets and Gorki streets. The price of the train ride is 1,000 AMD. There are mini vans that run to Yerevan every day from 7:00AM-8:00PM. There are no scheduled departures, but the 15 passenger mini vans depart when full. The vans leave from the Avtokayaran, located at the end of Shahumyan Street. To get there walk to the south from the Gyumri Central Square through the market area. The price is 1,500 AMD. Shared taxis operating on the same route leave from the same place and cost 2,500AMD per person. Mini vans and taxis go to the Kilikia Central Bus Station on 6 Admiral Isakov Ave in Yerevan and they return to Gyumri from the same place. There are buses, minivans and shared taxis that run from Gyumri to Vanadzor for 800-1200AMD. The buses and minivans have scheduled departures throughout the day every day. Shared taxis depart when full. Taxis are inexpensive within Gyumri; you will normally spend 500AMD per trip within the city and approximately 1000 AMD to the further sections. The taxis are easily found anywhere in the city. There are no car rental companies in Gyumri. You can rent them in Yerevan and drive 1 hour 48 minutes to Gyumri (see map). Visit Car A Van website to get a better picture of prices and their terms and conditions. Travel Gyumri offers comfortable and high quality cars and minibuses. The cars are available for airport pickups and trips to any city in Armenia or Georgia.